New gastroenterology summary mind maps added to help study for medical finals , including cirrhosis, ascities, hepatomegaly, coeliac disease, Wilson's disease, primary sclerosing cholangitis, primary biliary cirrhosis and much more. 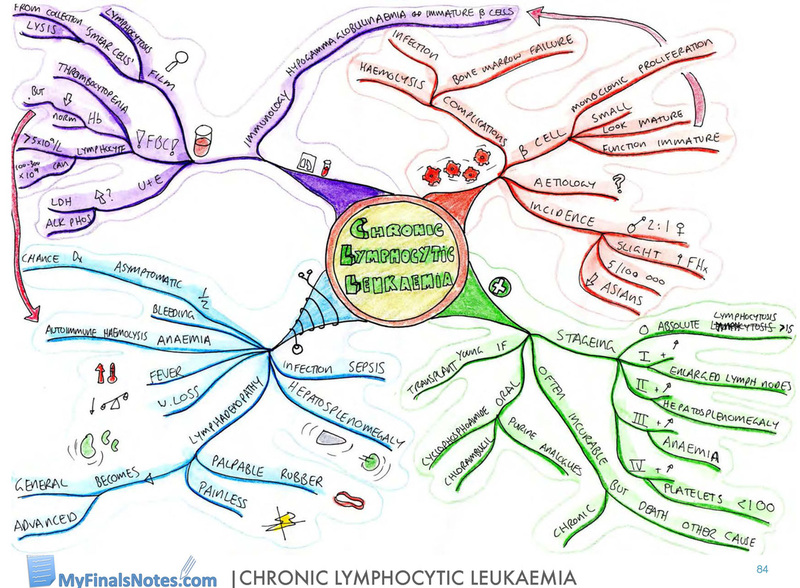 Leukaemia mind maps and revision notes updated and added to haematology mind maps. 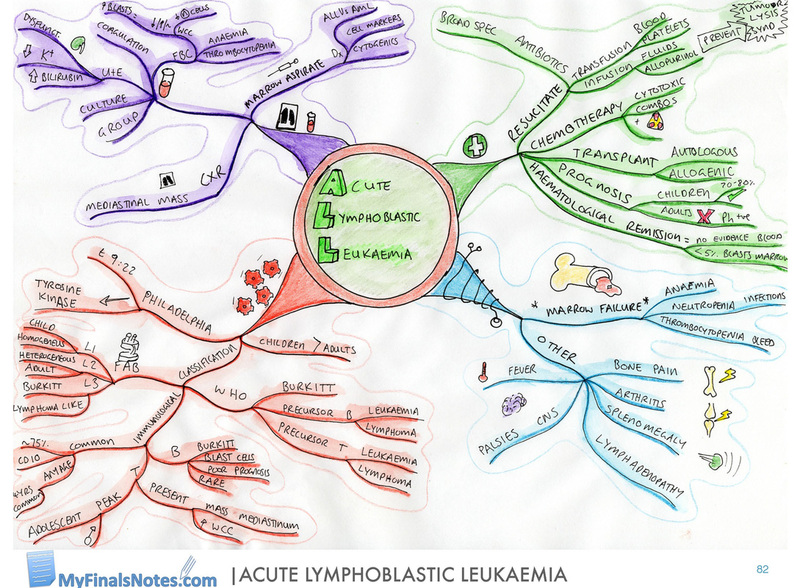 Find a mind map covering all of the common presenting features of Acute Lymphoblastic Leukaemia (ALL), Acute Myeloid Leukaemia (AML), Chronic Lymphocytic leukaemia (CLL), Chronic Myeloid Leukaemia (CML). Here you will find revision summaries in the form of easy to remember mind maps . Pathophysiology, common clinical features, investigations and management are summarised on one page for all four common types of leukaemia. 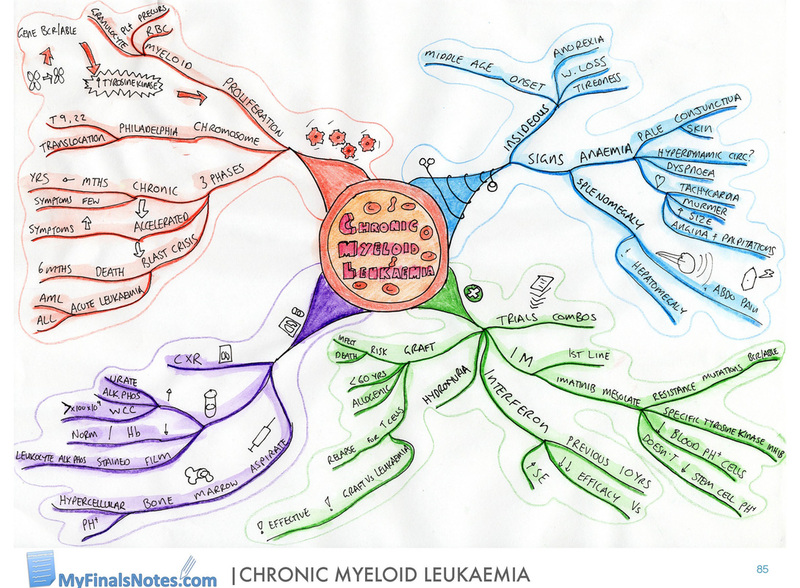 3 new anaemia mind maps recently added to medical revision notes. These cover all of the common types of anaemia with two detailed mind maps on iron-deficient and pernicious anaemia. Causes of the common types of anaemia are clearly summarised on one page, including microcytic, macrocytic, normocytic, and haemolytic anaemia. This visual reverence makes memorising the numerous causes of anaemia easy. 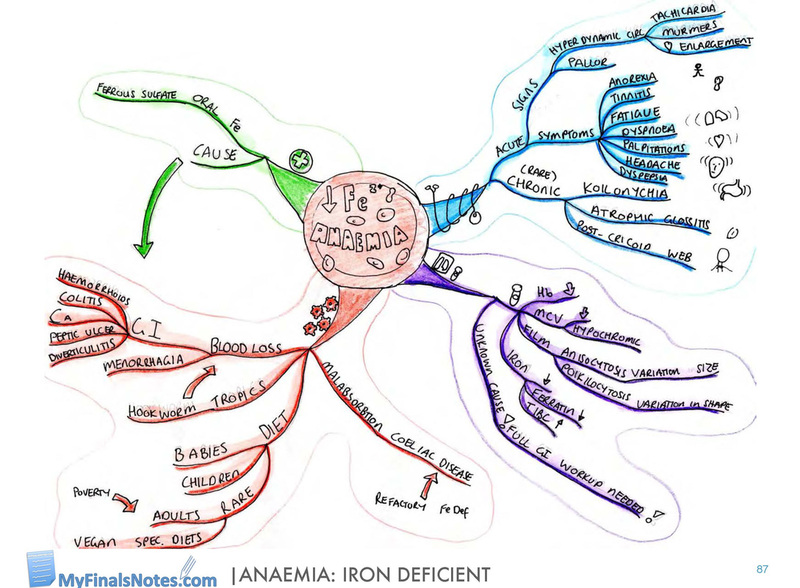 Pathophysiology, common clinical features, investigations and management are summarised on two mind maps of iron-deficient and pernicious anaemia. MyFinalsNotes.com is a source of free study guides, medical student revision notes, mind maps, reviews and links to other useful resources. Here you will find a large collection of mind maps designed to aid revision for medical school final exams, with new material being continually added. Mind maps are an excellent revision tool as they enhance connections between topics and improve the likelihood of successful recall, which is the main purpose of revision. We have all heard the phrase “A picture is worth a thousand words”. Using mind maps allows this concept to be utilized for revision as complex topics can be summarized on one page. This is particularly useful for medical students preparing for finals, where a large number of clinical conditions can be examined. Each mind maps is specifically designed to aid recall by being visually striking and memorable. At the center of each mind maps is a pictorial representation of a topic, aortic dissection in the example shown. Sub-topics then branch out of this central topic, again with a pictorial representation and common themes, again aiding recall. Pathophysiology includes mechanisms of disease, and is always represented in red or orange and is depicted as a number of cogs. Clinical features includes common signs and symptoms associated with the condition, and is always represented by a stethoscope and written in blue. Investigations include common tests used in the condition, and is represented by the color purple. A huge selection of mind maps can be found by simply searching for a topic, or by browsing by subject. Find useful study guides, memory tricks, revision notes and other resources.